It appears that gun control will be an issue in the upcoming election. We say this because Hillary Clinton says so, and is already bringing it up in her primary campaign. She may even have some emails on the subject. We hope so. It gives the Republicans a chance to spend a few million dollars to find out. Our position on guns is clear. Guns don’t kill. People do. So if you shoot all the people, problem solved. In Florida, if someone introduces a bill allowing you to shoot everybody, it would probably pass. What would not pass is a bill saying that crazy people should not be allowed to shoot people. The second amendment does not speak to that. But polls sure do. As recently as Tuesday’s Sun-Sentinel, a poll conducted for the University of South Florida said 85 percent of those surveyed favor mental health screening before a person can buy or receive a gun. That is a pretty lopsided poll, but consistent with studies elsewhere. You would think such attitudes could be easily translated into law. If that happened, there would be very few guns out there. There are basically three categories of people who possess handguns. One is law enforcement people who sometimes need to shoot the second category—bad people who need guns to protect themselves if something goes wrong when they are committing a crime. The third category, which may be the largest, is people who are crazy. These are the people who think they need a gun to protect themselves from category two criminals, which doesn’t happen very often, and when it does it is often somebody shooting somebody without any real good reason, except maybe they are drunk, and then claiming self defense under Florida’s “stand your ground” law. If these people really feel threatened, they are at least a little paranoid, which is a form of mental illness, depending on the degree of paranoia. 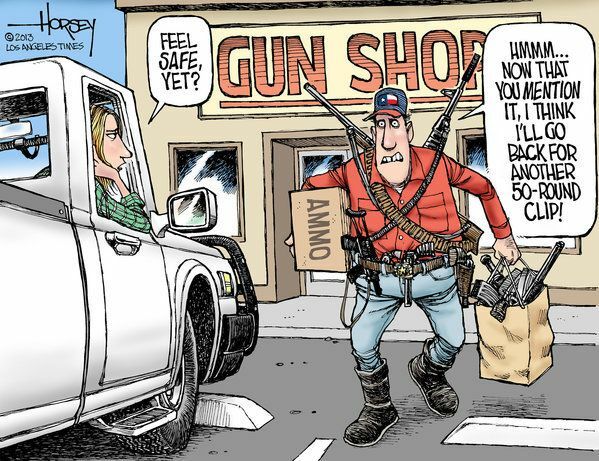 If there’s someone who read about a mass shooting, and immediately ran out and bought a gun (often another gun, because they think that government is going to take their guns away, so they need to own several of them), then they are seriously paranoid, which does qualify as crazy. And if they think they need to own a military assault rifle for protection, then they are seriously crazy. One way or the other, such people would have a hard time qualifying for a gun if they had to pass a mental health test and explain why they needed a concealable handgun or an assault rifle. They would be refused the purchase of a gun on the grounds they were crazy. In summary, most people who wanted to buy a gun would be deemed crazy, and therefore couldn't have one. This is such a basic concept that it would make a good book. Problem is somebody already wrote it. It is called Catch 22.